The scientific family name “Nepeta” comes from Nepeti, a town in the center of Italy where the herb was once cultivated. The species name cataria comes from the Latin word Catari, meaning “cat”. This reflects the special attraction the plant has on cats. Other Common Names: Catmint, catnep, catswort, fieldbalm, Katzenminze (German), hierba gatera (Spanish), katteurt (Danish), cataire (French). 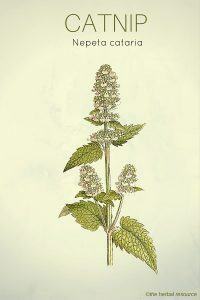 Habitat: Catnip is native to the countries of Europe with milder climates. It has been introduced and become naturalized in North America and Asia as well. This herb does well in garden soil and does not have much moisture requirements as many other plants. Plant Description: The plant belongs to the mint family (Lamiaceae). It has erect, square, branched stems and it can grow to a height of 2 to 3 feet. 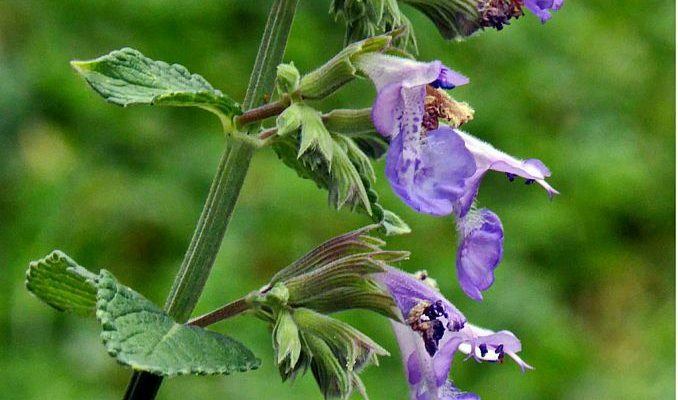 The catnip plant sports heart-shaped, toothed leaves in an opposite pattern, which are covered with fine downy hairs, especially on the under sides, giving the plant a grayish appearance. The small, tubular, two-lipped flowers grow in whorls that become denser as they approach the summit. The flowers are white to lavender with reddish-purple spots. This herb blooms from June to September and has a strong minty fragrance. Catnip contains an essential oil (consisting of nepetalactone, carvacrol, citronellol, nerol, geraniol, pulegone, thymol, caryophyllene and nepetalinic acid), iridoids, tannins, and rosmarinic acid. The soothing effect of catnip is attributed to the substance nepetalactone, not unlike the soothing ingredient found in valerian (Valeriana officinalis). Both nepetalactone and nepetalinic acid have been shown to significantly increase sleep duration in mice. The plant has been cultivated for centuries and has been used both as an herbal medicine and in cooking. It was one of the most important medicinal herbs in medieval monastery gardens. Catnip has a diaphoretic effect (increasing perspiration without raising body temperature) and antipyretic (anti-fever) effects so it could have uses for treating colds and as an herbal remedy for symptoms of the flu (influenza). A mild tea made from the flowering tops may be effective in treating colic, restlessness, motion sickness and nervousness in children. The antispasmodic qualities of this herb help to relieve many gastrointestinal disorders and cramping. A poultice of the leaves and flowers can be applied to reduce swelling from rheumatism, soft-tissue injuries and other inflammatory conditions. 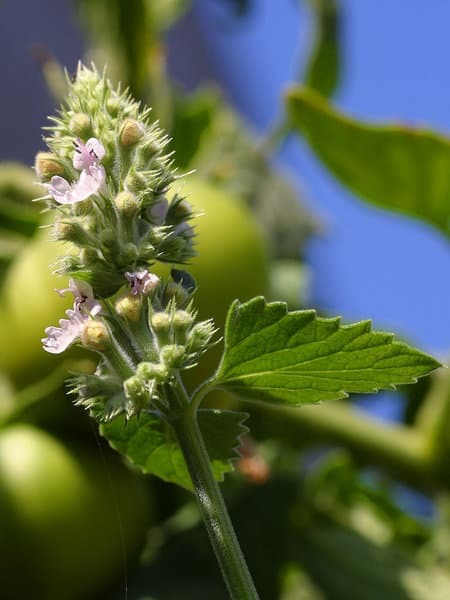 Catnip is also used as a muscle relaxant and mild sedative, which is why it is often used to relieve the pain of headaches (especially tension headaches) and migraines. This also explains its use to combat insomnia and other sleep disorders. Because of the herb’s mild sedative effect, it has recently been proposed for use in the treatment of ADHD (hyperactivity) in children. This plant is also used to bring about the menses in delayed menstruation and increase tone in the uterus. Nepetalactone, one of the ingredients of the essential oil, is shown to be effective as an insect repellant. It may also work as an external flea treatment on animals. Catnip has an intoxicating and almost an aphrodisiac effect on many cats. They eat the plants and roll in them with great pleasure. The substance that is most likely responsible for this effect is actinidine, an iridoid glycoside similar to those found in valerian (Valeriana officinalis). A small cloth bag containing dried leaves can be given to the cat to play with. Most of the time it is a big hit both for the cat and the owner. Research has shown that approximately one-third of cats do not respond to the plant. It is likely the reaction to it is genetically determined, and is transmitted through a dominant gene. Cats that lack this particular gene do not respond to catnip. This herb is often used for seasoning and meat tenderizing. Catnip is used as a herb or seasoning on salads. The oils are extracted and taken in capsule form or used externally. The oils or a potpourri concoction is used for aroma therapy. The herb can also be steeped as a tea. The tea may be prepared by adding 1 to 2 teaspoons to 1 cup of hot (not boiling) water. Steep it for 10 minutes then strain. It is common to take the capsules or tea three times daily. Catnip is not associated with any common side effects. The possibility of this herb causing uterine contractions means pregnant women should avoid using it. This herb has also shown no contraindications with other medicines. However, it is always a good idea to discuss any new herbal treatments with a professional health care provider if it is an addition to existing prescription medications.